He remembers precisely the moment he heard the fatal diagnosis: “You have AIDS”. That was 8 years ago and Lameck is now 60. He is tall and thin and walks with a limp. Lameck talks slowly, always wearing a smile. “I felt hopeless when they told me I was sick. I thought my life was over. But you see, here I am, healthy and active”, he says. Lameck now works for DAPP, Humana’s partner in Zimbabwe. He is part of the HOPE program that started in 2002 with the aim of building awareness that people with HIV can live with dignity, prolonging their lives and being productive with the support of their communities. Although Zimbabwe is one of the most affected countries by the HIV epidemic in sub-Saharan Africa, with an adult HIV prevalence of 15%, the country has achieved a great deal in a short time. It currently sustains universal coverage of treatment to prevent mother-to-child-transmission of HIV (93%) and adult antiretroviral therapy with 95% of adult Zimbabweans eligible for HIV treatment receiving it. However, in terms of social acceptance, there is still a long way to go. 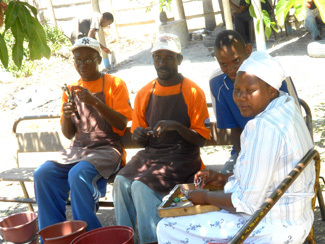 Majecha Ruzvidzo has been working as a project leader since HOPE Harare begun in 2002. “The program was a response to the increasing effects of HIV in the suburban areas of Zimbabwe and Harare in particular. We noticed that HIV and AIDS were affecting active population especially those who worked many hours away from home and often missed the HIV/AIDS information when the peer educators made rounds in the residence”, she explains. HOPE Harare offers information sessions on HIV/AIDS to the community, assistance with access to health services such as STI/STD (Sexually Transmitted Diseases) treatment, HIV testing and referral services, if necessary. In addition, peer educators and trained activists are involved in awareness campaigns in schools, social gatherings and women’s clubs. 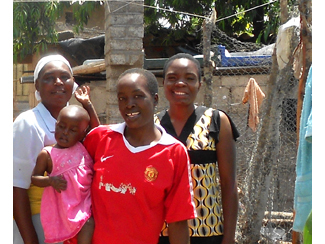 Like the sewing club in Harare to which Jessica, a 25-year-old woman mother of two, belongs. 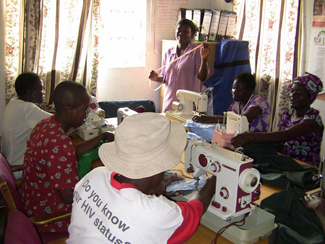 “Thanks to the HOPE project, we now have sewing machines and fabrics. We sew for orphans and for HIV affected families and we sell the remaining clothes so we can make some money. We also use this tailoring club as a mode to socialize. Our life has improved in every way!”, relates Jessica while sewing a colorful dress. The program reaches people from all kind of social groups. After years of working as a prostitute, the day Alice learnt she was seropositive, she thought her life was over. Thanks to the support and counseling she received from HOPE Harare, she is now full of life and looking at a bright future as a pastor, as she has just graduated in Theology. “I feel so grateful. I couldn’t have made it without them. They made me believe in myself and understand that my life was no over because of the HIV virus”, she says with a bright smile. The Hope program is all about welcoming everyone in the community, preventing HIV infection and improving the lives of those who are already struggling with the sickness.